Being part of the work team that drills and completes the well. Providing food and housing for the drill team while they are working there. Executing a Well Construction Agreement with each village or district agreeing that water from a TWP well is to be given to all members of the community, no matter their religion, gender, or tribal or political affiliation. 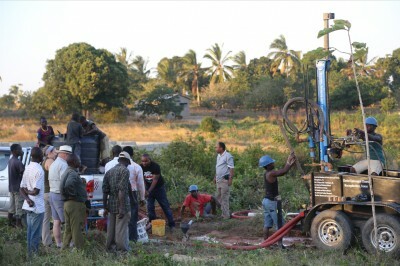 Agreeing in that same Well Construction Agreement to provide ongoing support and maintenance of the water pump and well. Training local Tanzanians how to help drill and maintain the wells, and by having them contribute either money or labor in that construction so that the village is invested in the project. Having processes and procedures: funds for a new well project are not disbursed until all the required signed Well Construction Agreement are in hand from the recently completed project. Each well project has a required TWP Well Budget submitted and approved before the project begins. If a village cannot commit to its end of the deal, then construction doesn’t take place. If a village fails to live up to its part of the deal, we’ll pull the well-top equipment and relocate it to a village that will.